I have heard so many times how great Coconut Oil is and how many uses it has is so crazy! I purchased the largest tub (500ml) of Superdrug Coconut Oil ‘ For hair and skin – Fragranced – Naturally Softens Skin – Tames and Nourishes Hair’ which was currently in the 2 for £10 offer, so I could not just purchase the one and I am so glad that I did! I have really wanted to find a great cleanser but I didn’t really want to put more chemicals on my face, especially as I have psoriasis (I have a recent blog post on how I deal with my Psoriasis here). I wasn’t quite sure where to go for ages, didn’t want to spend too much on a product that I would fall in love with and then never be able to afford it.. and that’s when I came across more articles on Coconut Oil such as Draxe’s here. I was not expecting huge things from using Coconut Oil as a cleanser, I thought that ‘Ok, it will take off most of my make up, but I’m still going to have to really scrub at my eyeliner (it’s pretty much like permanent marker) and my lip colour is always so hard to budge! Oh boy, was I surprised?! I don’t think I could believe it at first that whilst rubbing my eyelids lightly, it actually came off in a few seconds! Although, you will have huge black splurges around your eyes which frightened the life out of my boyfriend when he saw me – but I was amazed with the outcome! I was really impressed with this and I instantly felt really smooth as it sank into my skin. I decided to put Coconut Oil onto my flakey patches of Psoriasis too (Apologies if that grosses anyone out haha!) and my, my, my.. the next morning, my flakes were gone! Behind my ears have never been smoother, the sides of my nose, forehead, scalp and neck.. so smooth! And who wouldn’t want to cleanse AND moisturise at the same time, right? Saves time and ‘killing two birds with one stone’. 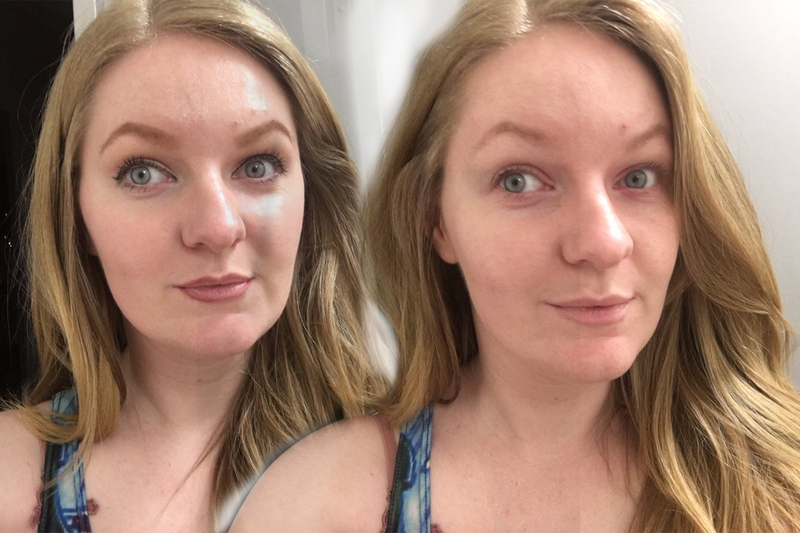 I wasn’t feeling too great on Days 2 and 3, so I didn’t take any photos those days but I did still carry on with the Coconut Oil and still have no disappointments! Again, here I am wearing the Seventeen Tattoo Me Eyeliner which is incredible and does not budge all day long, let me say..
We are now at Day 5 and I really do feel like the condition of my skin is improving. It’s much softer, seems to have evened out and might have possibly helped with healing the two big spots I had on my face! I am still loving it and have even started to plaster it all over my feet and put socks on to stop me from slipping and sliding everywhere! My feet feel so, so, so smooth the morning after! I don’t think I can rave enough about Coconut Oil so far – I haven’t used it in my hair yet, but it is suppose to be incredible, I am just a little scared incase I cannot get all of the product out and my hair is super thick, so it will take ages to rewash! My skin feels like it is getting much better at the moment, firstly my Stye has finally disappeared and also so have the spots. I am feeling smoother, much cleaner and I have a lot less flakey Psoriasis! So that’s a win-win in my eyes! I highly recommend giving Coconut Oil a try so far, you can get a 125ml tub from Superdrug for £2.49. At least it’s not breaking the bank, is natural and you can use it for so many other things if you don’t agree with it! Overall, I found that my skin was much smoother, reduced the flakiness of my skin and really gave me a glow. I also found that I am very boring and wore the same make up look every day for a week, so I think I need to jazz that up a little! I only have one set of make up that I wear I don’t wear it very often though. I tried coconut oil for a time. I probably should buy some more. Great post!! I love Coconut Oil ive been using it everyday for the past 2 months, my skin has never felt better!! It also makes an amazing night moisturizer too. I love plastering my feet in Coconut Oil and they feel oh so good! This is a great post. I’ve been so intrigued by coconut oil and my boyfriend has really bad eczema so I’ll be going to superdrug asap. Is it fine to use regular coconut oil on your face two times a day? Or should I move into a diffrent moisturizer?